EMBARGOED: Publication of information about the research described here is prohibited — in any medium — by the journal Nature until the paper's Advance Online Publication (AOP) at 1:00 p.m. U.S. Eastern Time (1800 London time) on November 22, 2017. For the first time, a science experiment has measured Earth's ability to absorb neutrinos — the smaller-than-an-atom particles that zoom throughout space and through us by the trillions every second at nearly the speed of light. The experiment was achieved with the IceCube detector, an array of 5,160 basketball-sized sensors frozen deep within a cubic kilometer of very clear ice near the South Pole. The results of this experiment by the IceCube collaboration, which includes Penn State physicists, will be published in the online edition of the journal Nature on November 22, 2017. "This achievement is important because it shows, for the first time, that very-high-energy neutrinos can be absorbed by something — in this case, the Earth," said Doug Cowen, professor of physics and astronomy & astrophysics at Penn State. The first detections of extremely-high-energy neutrinos were made by IceCube in 2013, but a mystery remained about whether any kind of matter could truly stop a neutrino's journey through space. "We knew that lower-energy neutrinos pass through just about anything," Cowen said, "but although we had expected higher-energy neutrinos to be different, no previous experiments had been able to demonstrate convincingly that higher-energy neutrinos could be stopped by anything." The results in the Nature paper are based on one year of data from about 10,800 neutrino-related interactions. Cowen and Tyler Anderson, an assistant research professor of physics at Penn State, are members of the IceCube collaboration. They are coauthors of the Nature paper who helped to build the IceCube detector and are contributing to its maintenance and management. This new discovery with IceCube is an exciting addition to our deepening understanding of how the universe works. It also is a little bit of a disappointment for those who hope for an experiment that will reveal something that cannot be explained by the current Standard Model of Particle Physics. "The results of this Ice Cube study are fully consistent with the Standard Model of Particle Physics — the reigning theory that for the past half century has described all the physical forces in the universe except gravity," Cowen said. Neutrinos first were formed at the beginning of the universe, and they continue to be produced by stars throughout space and by nuclear reactors on Earth. "Understanding how neutrinos interact is key to the operation of IceCube," explained Francis Halzen, principal investigator for the IceCube Neutrino Observatory and a University of Wisconsin-Madison professor of physics. "We were of course hoping for some new physics to appear, but we unfortunately find that the Standard Model, as usual, withstands the test," Halzen said. IceCube's sensors do not directly observe neutrinos, but instead measure flashes of blue light, known as Cherenkov radiation, emitted after a series of interactions involving fast-moving charged particles that are created when neutrinos interact with the ice. By measuring the light patterns from these interactions in or near the detector array, IceCube can estimate the neutrinos' energies and directions of travel. The scientists found that the neutrinos that had to travel the farthest through Earth were less likely to reach the detector. Most of the neutrinos selected for this study were more than a million times more energetic than the neutrinos produced by more familiar sources, like the Sun or nuclear power plants. The analysis also included a small number of astrophysical neutrinos, which are produced outside the Earth's atmosphere, from cosmic accelerators unidentified to date, perhaps associated with supermassive black holes. "Neutrinos have quite a well-earned reputation of surprising us with their behavior," says Darren Grant, spokesperson for the IceCube Collaboration, a professor of physics at the University of Alberta in Canada, and a former postdoctoral scholar at Penn State. "It is incredibly exciting to see this first measurement and the potential it holds for future precision tests." In addition to providing the first measurement of the Earth's absorption of neutrinos, the analysis shows that IceCube's scientific reach extends beyond its core focus on particle physics discoveries and the emerging field of neutrino astronomy into the fields of planetary science and nuclear physics. This analysis also is of interest to geophysicists who would like to use neutrinos to image the Earth's interior in order to explore the boundary between the Earth's inner solid core and its liquid outer core. "IceCube was built to both explore the frontiers of physics and, in doing so, possibly challenge existing perceptions of the nature of universe. This new finding and others yet to come are in that spirt of scientific discovery," said James Whitmore, program director in the National Science Foundation's physics division. 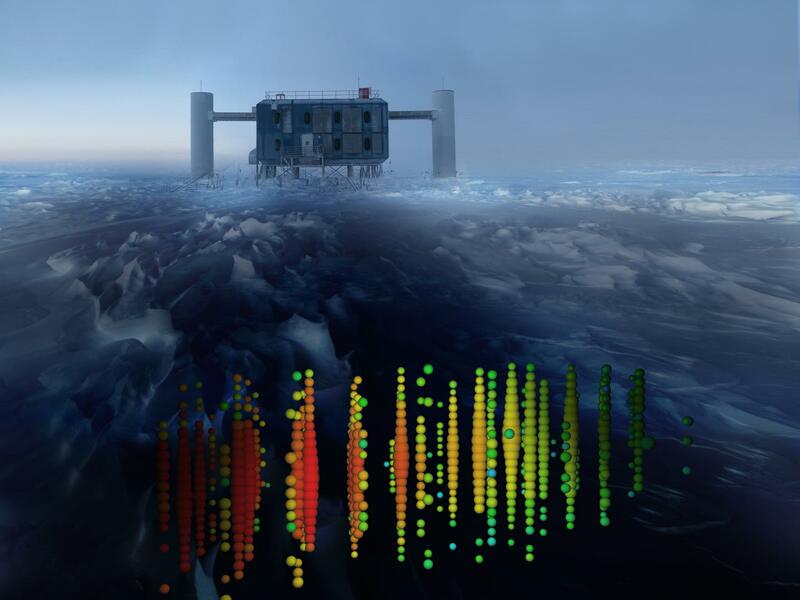 Physicists now hope to repeat the study using an expanded, multiyear analysis of data from the full 86-string IceCube array, and to look at higher ranges of neutrino energies for any hints of new physics beyond the Standard Model. Other Penn Staters on the IceCube team are postdoctoral scholar Philipp Eller; graduate students Feifei Huang, Daria Pankova, and Justin Lanfranchi; and undergraduate student Kevin Crust. The website of the Penn State IceCube team is online at http://sites.psu.edu/icecubepennstate/. The work was supported by the U.S. National Science Foundation-Office of Polar Programs, U.S. National Science Foundation-Physics Division, University of Wisconsin Alumni Research Foundation, Grid Laboratory of Wisconsin (GLOW) grid infrastructure at the University of Wisconsin-Madison, Open Science Grid (OSG) grid infrastructure, National Energy Research Scientific Computing Center, Louisiana Optical Network Initiative (LONI) grid computing resources, U.S. Department of Energy, and United States Air Force Academy; Natural Sciences and Engineering Research Council of Canada, WestGrid and Compute/Calcul Canada; Swedish Research Council, Swedish Polar Research Secretariat, Swedish National Infrastructure for Computing (SNIC), and Knut and Alice Wallenberg Foundation, Sweden; German Ministry for Education and Research (BMBF), Deutsche Forschungsgemeinschaft (DFG), Helmholtz Alliance for Astroparticle Physics (HAP), Initiative and Networking Fund of the Helmholtz Association, Germany; Fund for Scientific Research (FNRS-FWO), FWO Odysseus programme, Flanders Institute to encourage scientific and technological research in industry (IWT), Belgian Federal Science Policy Office (Belspo); Marsden Fund, New Zealand; Australian Research Council; Japan Society for Promotion of Science (JSPS); the Swiss National Science Foundation (SNSF), Switzerland; National Research Foundation of Korea (NRF); Villum Fonden, Danish National Research Foundation (DNRF), Denmark. The IceCube Neutrino Observatory was built under a National Science Foundation (NSF) Major Research Equipment and Facilities Construction grant, with assistance from partner funding agencies around the world. The NSF Office of Polar Programs and NSF Physics Division support the project with a Maintenance and Operations (M&O) grant. The University of Wisconsin-Madison is the lead institution for the IceCube Collaboration, coordinating data-taking and M&O activities.